Valentine’s Day is fast approaching. Those looking to marry on the special day will have the opportunity to do so at East Ohio Conference United Methodist Churches on February 14. Trinity UMC (Mahoning Valley District) in downtown Youngstown will host its third annual Valentine’s Day walk-in weddings at the church’s Chapel of the Friendly Bells from 10:00am – 4:00pm. The Rev. Jerry Krueger of Trinity UMC and the Rev. Susan Brown of Canfield UMC will offer a simple, Christian wedding service including traditional wedding vows, exchange of rings, scripture and a blessing of the couple. Wedding vow renewal services will also be offered. The $50.00 fee for each wedding will be donated to the Good Shepherd Kitchen in Youngstown and the Canfield Community Care Net. Weddings will be performed in the order that couples arrive. Couples must bring their wedding license, identification and the $50.00 fee in cash. Weddings will not be performed for participants who are under the influence of drugs or alcohol. Chapel of the Bells at Trinity UMC is located at 30 W. Front St., next to the Courthouse. For more information, please call the church office at (330) 744-5032. North Canton Faith UMC (Tuscarawas District) pastors the Rev. Cara Stultz Costello and the Rev. Steve Stultz Costello are offering couples the opportunity to get married or renew their vows. Ceremonies will take place between 10:00am – 8:00pm. Couples must call the church office prior to February 9 to reserve the time for their Feb. 14 wedding or renewal. At the time of their ceremony, couples must provide a current wedding license, a $50.00 love offering for Faith Kitchen – a meal ministry in conjunction with Crystal Park UMC for families in Canton – and a $50.00 fee. Couples who attend the marriage retreat on Feb. 28 will have their $50.00 fee refunded to them. North Canton Faith UMC is located at 300 Ninth St. NW. For more information – and to place your reservation – please call the church office at (330) 499-6040. 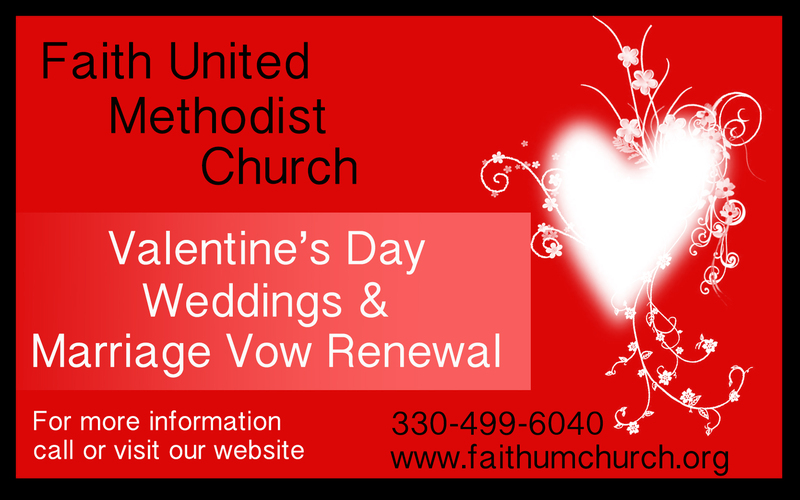 Read more about the North Canton Faith UMC Valentine’s Day wedding and marriage renewal ceremonies. West Lafayette UMC (Three Rivers District) will host a service of marriage at 3:00 pm on Feb. 14. The Rev. Dr. William E. Buckeye will offer liturgy and deliver a message to all couples – with each couple offering its own vows and presenting rings individually. Couples must present a valid marriage license. There is no cost to participate in this marriage ceremony but gratuities to support the church’s Redbird Mission Trip this June will be accepted. A cake reception is being offered afterwards in the church Fellowship Hall. Additionally, “Rev. Bill,” as his congregation calls him, will present each couple with a small remembrance of the day. West Lafayette UMC is located at 120 W. Union Avenue. For more information, please call the church office at (740) 545-6368.